Every year in mid to late February, we see an increase in the number of houses for sale in Tallahassee, FL. We can speculate on the "why they do it," but the numbers do not lie as the annual number of property listings in Tallahassee typically grows from this point on through the month of June. This year has the potential for a double-whammy too, where not only will we see a seasonal surge, but we might also see some sellers who have been awaiting a renewal in home values emerge from the shadows. Our first real estate graph shows that the number of homes listed for sale in the Tallahassee MLS is indeed on the rise. Like than annual migration of zebra, wildebeest and antelope in East Africa, this predictable pattern continues to hold true. The purple lines show the 30 day average number of daily listings in the Tallahassee MLS (measured on the left vertical axis), while the light-blue line shows the average asking price (measured on the right vertical axis). 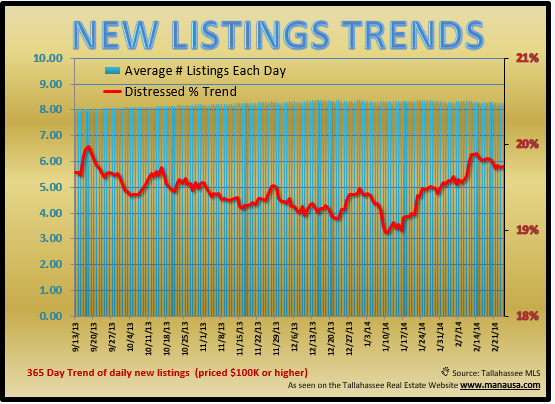 Note that both the number of daily listings, and the average asking price is lower today than it was one year ago. Also note, we are only tracking residential properties priced above $100,000 in the Multiple Listing Service. The short term trends above help us get a feel for current movement in the Tallahassee real estate market. But we can also get a feel for annual changes (while looking for that surge of home sellers who have been waiting to test the market). 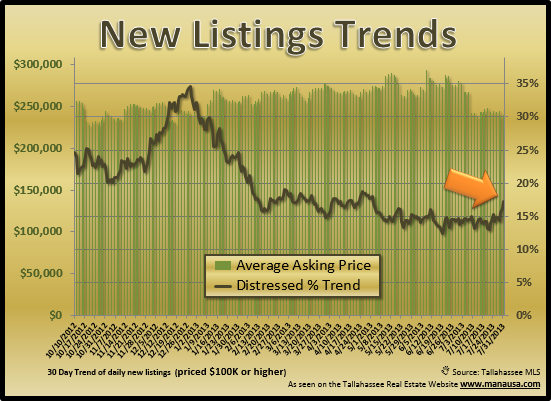 The graph below shows the one year trend of new listings taken each day, as well as the average ratio of distressed listings entering the market to all listings entering the market. The long term trend graph removes all influence of real estate seasonality as each point on the graph represents 365 days of information. Note that over the past five months, there has been almost no growth in the number of listings hitting the market, and the trend of distressed properties has risen only minutely. So what we are seeing is no evidence of sellers moving out of the shadow inventory into the competition among the Tallahassee MLS listings of houses for sale in Tallahassee, FL. This is a bit surprising to me, as I felt that rising prices would start to bring the patient sellers back to the market. Of course, the season has only just begun, and perhaps this is a forecast that will be fulfilled once the 2014 real estate market is well under way. If you are thinking about selling and want to know how your home will compete with all the houses for sale in Tallahassee, FL, just drop me a note and we can schedule a time to help you evaluate your equity when you do decide to sell.